I found another model for my Ultima as tabletop miniature game project. I bought two kings which can represent Lord British. The one on the let is from Mega Miniatures. He looks very generic Medieval, which is good for the Medieval fantasy world of Britannia. The model on the right comes from the Saxon range produced by Black Tree Miniatures. Initially I preferred this model, but now that I've become interested in the historic 9th century Saxon/Viking wars, I think I may instead paint him up as King Alfred. 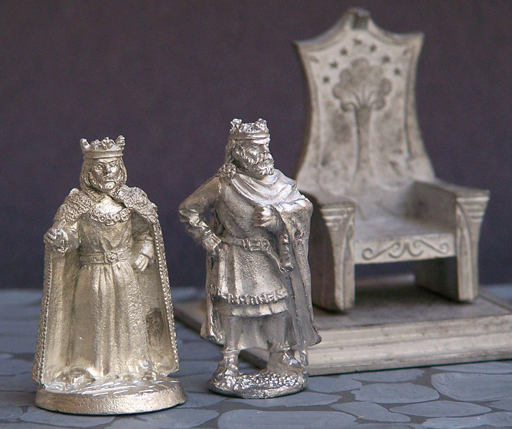 The dais and throne come from an old Mithril Miniatures pack of the Lord Denethor (from LOTR). By modifying the high back into an ankh shape this will make a very fine throne for Lord British. Who's Lord British? Within the world of the old Ultima PC RPG series he is the king of all the lands of Britannia. He is the alter-ego of the real-life creator of the Ultima series, Richard Garriott. The in-game portraits of Lord British were all drawn after Garriott's own face. A classic example of an eccentric millionaire, Garriott recently employed his video game wealth to become one of the world's first space-tourists. Anyway, getting back to 28mm models, I also found a great one for Lord Blackthorn. He's the baddie that caused all sorts of trouble in 1988's Ultima V. Incidentally, if you're at all interested in playing this classic game, the brilliant team at Lazarus have re-released Ultima V with 3D graphics, playable on your 21st century computer. If you want to see painted minis from this project click on the "Ultima XXVIII" label link bellow. So far I've painted the Avatar, Iolo, Dupré, the town guard, and some gremlins. If you're an old Ultima fan, leave a comment and let me know what you think! 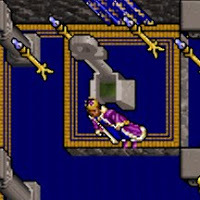 A while back I heard that someone created a tabletop Ultima RPG, and PDFs of it were even floating around online. I've since run down every lead and search I could think of and all have come to naught. No, Sorry I don't know anything about that. I'm using an existing wargame ruleset, Song of Blades and Heroes. It's more moving miniatures and rolling dice to fight, and less verbal role play. These rules were made to use any fantasy setting of the player's choosing, so it's been easy to insert the Ultima characters and monsters. I am writing a tabletop Ultima game. Well, I'm adapting an existing RPG - Swords & Wizardry Whitebox (a retroclone of 1974 Original D&D) and basing it on Ultimas 1 to 3. I write about it extensively on my blog and I have links to the PDFs. It's still a work in progress, and I'm starting to playtest. I should note that this is completely unlicensed and I do not have permission from EA or Origin. I'm doing this as a fan interpretation/fan tribute, similar to what the guys did for U5 Lazarus.